If you are an Android users then you are ware with the Adb commands, unroot, backup and restore feature. To run most of these commands you need an Android ADB and Fastboot drivers. 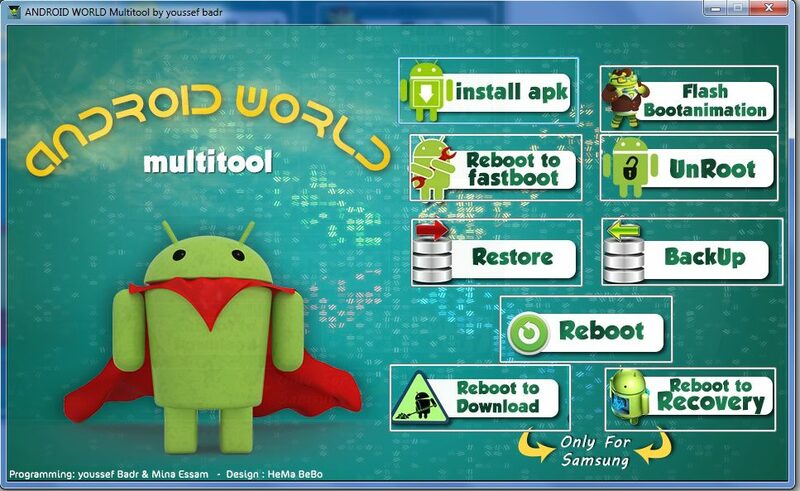 Now you can do all these task on your windows machine with this free Android World Multitool application. Thanks to the XDA developer OP, Who recently released this application in the XDA forum to make things easier and faster. This free windows tool will help you to run lots of tasks on your android device without opening the command prompt windows such as Install apk files, change boot animation, Unroot the device, backup and restore the date of the phone or tablet etc. One of the most easiest way tp run all these type of commands without the knowledge of ADB commands. All you have to install the tool on your PC C:/ drive and you are ready to go. Once the App is installed, reboot your system and enjoy all the feature on your desktop. To install new boot animation on any Android apk files on your device you need to place those files in the bootloader or apk folder. Reboot option are simple to use, click on the tab of the reboot option and your device will reboot on the different modes. Backup and restore work very fine on all of the android device, just click the tab and backup data will save on your android, and from the restore option you can restore that backup files on your devices easily and quickly. Some feature of the application will work only on the Samsung device like Reboot to download and Reboot to Recovery. The Application is in the starting stage and more feature will added soon on the application.